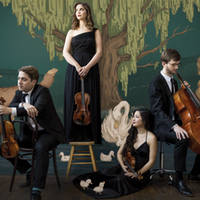 The award-winning Aeolus Quartet joins Scrag’s co-Artistic Directors Mary Bonhag (soprano) and Evan Premo (bass) and prominent Montpelier-based theater artist Kim Bent in a program of fantastical music inspired by favorite childhood tales. Audiences of all ages are encouraged to join in on the fun! Admission is "Come as you are. Pay what you can." Select the event you plan to attend. All concerts are "Come as you are. Pay what you can." At-will donations are collected during intermission.